The average size of newly built single-family homes has declined for two consecutive quarters as the overall housing market recovers. Despite the recent leveling, current new home sizes reflect post-recession increases due to an atypical mix of home buyers. As more first-time buyers return to the market, typical home size will continue to post slight quarterly declines. According to third quarter 2014 data from the Census Quarterly Starts and Completions by Purpose and Design and NAHB analysis, average single-family square floor area decreased from 2,651 to 2,601 square feet, while the median fell from 2,472 to 2,414 square feet. On a less volatile one-year moving average, the recent trend of increasing size during the post-recession period appears to have cooled since the start of 2014. Nonetheless, current levels remain higher than the pre-recession period. Since cycle lows and on a one-year moving average basis, the average size of new single-family homes has increased 12% to 2,659 square feet, while the median size has increased almost 17% to 2,457 square feet. 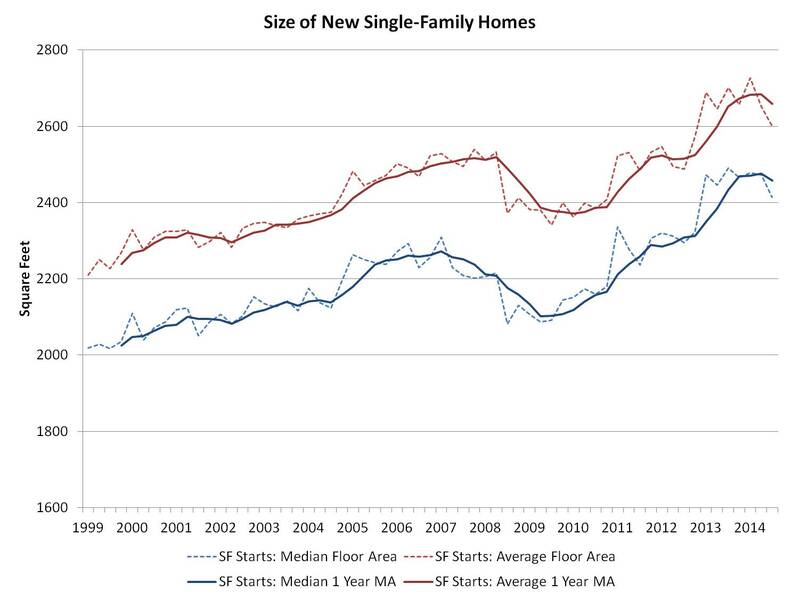 The recent rise in single-family home size is consistent with the historical pattern coming out of recessions. Typical home size falls prior to and during a recession as some homebuyers cut back, and then sizes rise as high-end homebuyers, who face fewer credit constraints, return to the housing market in relatively greater proportions. This pattern has been exacerbated in the last two years due to market weakness among first-time homebuyers. In contrast to single-family patterns, new multifamily apartment size is down compared to the pre-recession period. This is due to the weak condo market.